Incredibly well maintained THOROUGHLY, THOUGHTFULLY & RECENTLY updated, the hull both above and below the waterline is pristine. The decks are in superb shape and the teak looks fantastic. The overall layout of the boat, both above and below decks, is really well configured for long range cruising as well as living aboard. 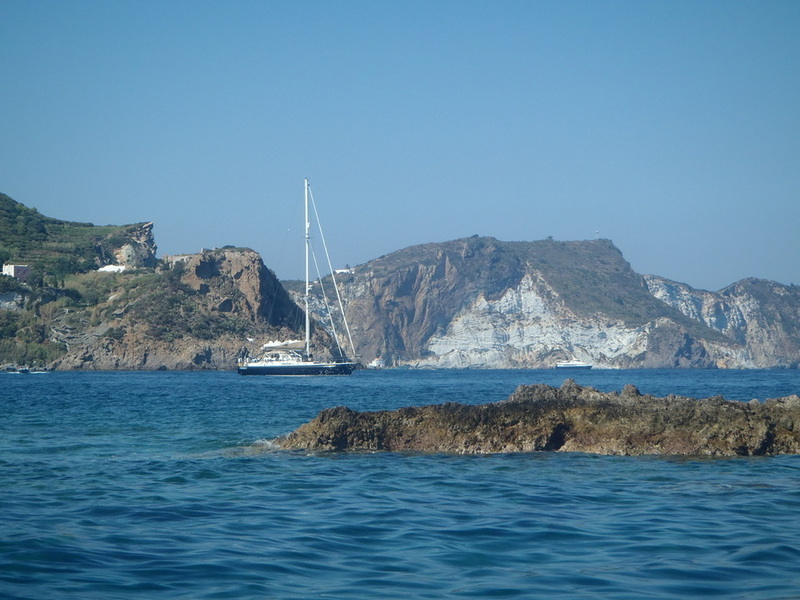 Having cruised extensively myself, I’m looking for several ‘zones’ of success in a blue water cruising yacht. The most important space is the cockpit and on deck because that’s where I plan to spend the most time. The center cockpit on Azzura is large, deep, and comfortable. You're protected from the elements on all sides and still have easy access to sail handling systems. It's easy to single hand this yacht! The coamings are tall and angled for good bracing while healed. Passage into and out of the cockpit to the decks or down below is easy even in rough seas. The hatch opening to spaces below is large enough that when you and crew are both above and below decks, you’re well within sight and earshot of each other at all times. For entertaining, guests can be both in and out of the boat and still feel together. EVERYTHING you need to handle to manage the boat underway is right at your fingertips or just a step or two away -- critical characteristics for offshore heavy air sailing. Once you leave the cockpit, side decks are HUGE and regularly maintained. There is easy access to every part of the rig, a nice storage area forward of the mast for the dinghy and life raft, and lots of great places to lounge with a cocktail in hand. You have to step aboard a Tayana to appreciate the incredible craftsmanship from the artisans at the Ta Yang Yacht Yard. The joinery is simply phenomenal. The deep green interior upholstery is gorgeous as well and in fantastic shape. This is a big boat and feels like it as you pass through interior spaces. That said, there’s no place you can be where there isn’t something substantial to grab hold of while moving around in rough seas. The galley is one of the best I’ve encountered. There’s lots of space around the sink area, on both sides of the range. There’s lots of fridge/freezer space AND there’s plenty of room for two chefs to work in the galley at the same time – very rare on a yacht! The electronics on this boat are top-of-the-line and cover nearly all the bases. They're nearly ALL new, most in 2012 and 2013. They do EVERYTHING you need including a modern AIS system which has only recently become popular with cruisers. The electrics on this boat are incredible. Brilliantly laid out. Wire chases through the boat, though busy due to all the systems, are completely accessible. The drawings that came with this boat are well crafted and super helpful when servicing systems. Plenty of battery power. Azzura recently received one of the best wind generators in the business, the Ecclectic D400 with control panel, and brake. Along with new batteries, this yacht is totally capable of long passages away from shore power. Love this engine room! It’s really a ROOM! The Perkins is easily accessed as is the Onan7.5kW genset, the NEW (2012) water maker, the Racor fuel filters, the oil change system and This engine is in beautiful shape. Regularly serviced with well managed engine hours (about 4000), it’s a Perkins! One of the best tractor motors in the world and capable of 7,000 to 10,000 hours of use without need of a major refit. I’m a chef and this is chef’s galley for sure. Great counter space. High quality appliances. Fantastic fridge and freezer space with new Sea Frost super efficient 12V systems. Storage compartments and spaces are thoughtfully laid out for maximum efficiency. I like that the galley is out of the way of passage through the yacht. The chef does not impede traffic flow through the boat. There’s room for two in the galley if necessary as well for companion cooking. Heads are more like bathrooms with lots of space, stand-alone showers, good storage, and high quality toilets. Sails in excellent condition, new in 2011 & 2012, and should have many years of life left. Rig is turn-key with new standing rigging as well as recent running rigging -- all replaced. 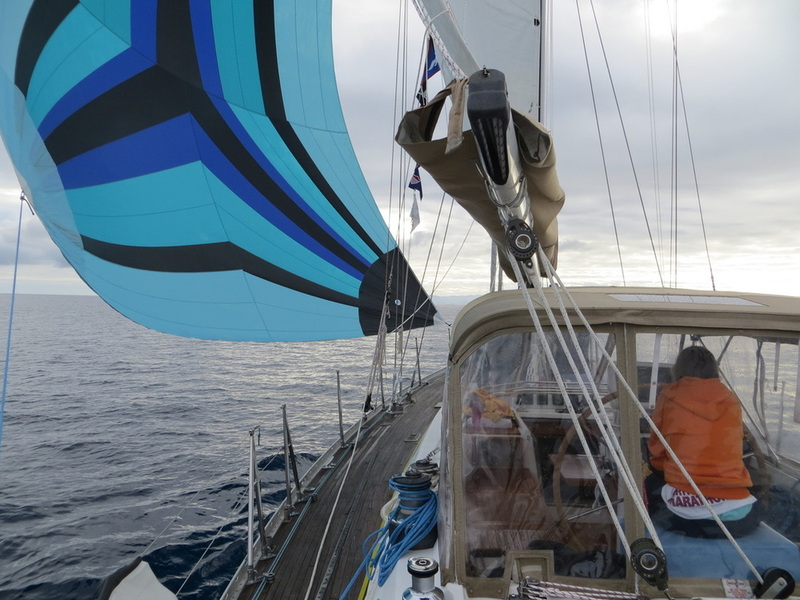 The five-batten mainsail with stack pack is easy to reef in big wind conditions. The genoa and staysail are both reelable and on new Harken furlers in 2013, so between the three sails, you can set the boat for ANY point of sail or wind condition. She’s a big boat and doesn’t get pushed around very easily. There’s safety and comfort when you have 48,400 pounds of yacht under you, regardless of sea conditions. 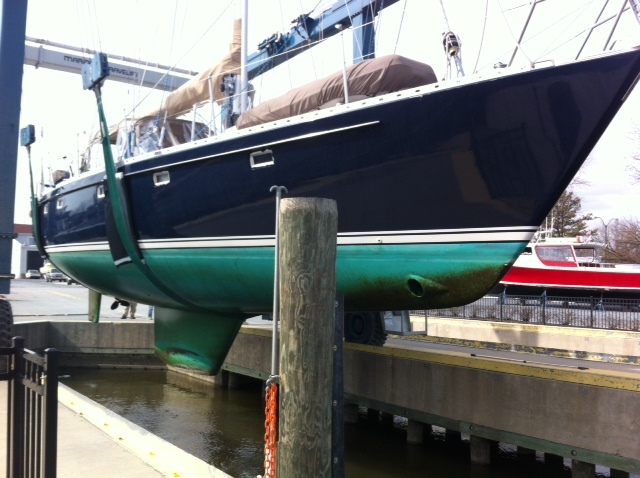 Azzurra's owners have had a fantastic time cruising these past few years, but their adventures are coming to an end. The yacht is in Italy at the moment but soon will begin her trek back to US waters, specifically to the Annapolis area here on the Chesapeake bay. We are letting Azzurra go because the window of opportunity has narrowed for us. Most of the cruising couples we have met have a window that is defined by their health, their parents’ health and their grandchildren. We had planned for a wider window that included cruising in the Pacific, but our closing window has forced us to modify our plans. 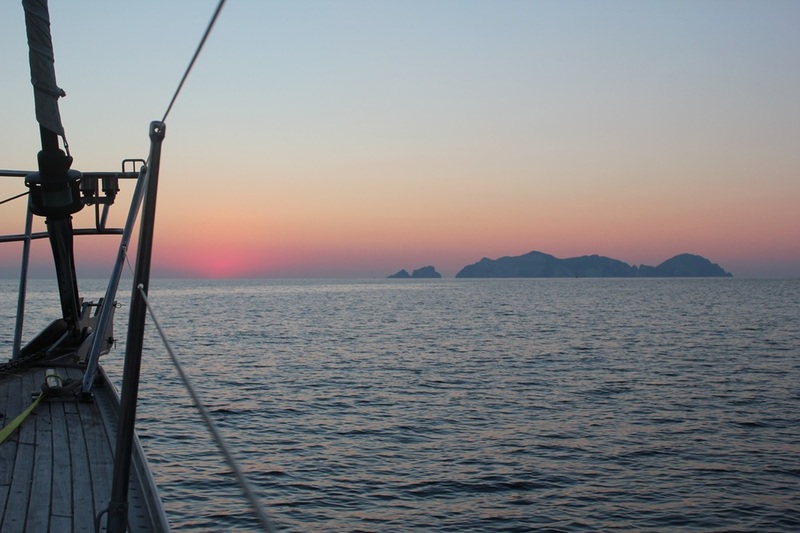 But we have achieved our dreams of sailing across the Atlantic in Azzurra and cruising the Mediterranean for over a year. It was the opportunity of a lifetime that will provide endless memories of fellow cruisers that we have met, awesome sights, and thoroughly enjoyable experiences. Stepping down the companionway steps, you enter into the spacious main salon. The Tayana 55's layout provides fantastic space throughout with around 6'-6" of headroom. To the port lies a beautiful U-shaped setee that can comfortabley seat six for a meal on board. Opposite the dining table on the starboard side are two lounge chairs forward of the navigation station. The main salon provides ample storage below and above all of the seating. To the starboard of the companionway stairs is the navigation station with a beautifully finished chart table as well as navigation electronics, The mounting panels are interchangeable in case of future electronics updates. Nearly all electronics are new in 2012. A sound-shield door in the aft shower provides easy access to a walk-in mechanical and engine room what could not make maintenance any easier. It provides easy access to the upgraded Perkins 6 cylinder 135HP engine, Onan 7.5kW generator, Balmar alternator, air conditioning compressor, water maker, and the battery bank. On the starboard side of the companionway hatch, you step down into the passageway galley with corian countertops that provide a large amount of very functional cooking space. Facing aft, there is a large double SS sink and a Broadwater 4-burner stove and large top and side loading freezer and refrigerator as well as storage both above and below the counters. Passing through the galley, you enter the owner's cabin which features a large centerline queen with a step up to his and her seating, storage and hanging closets. Forward on the port side of the master suite is the entrance to a private head with a seperate shower stall. A washer/dryer is located in the aft stateroom. Forward of the main salon bulkhead, a step down brings you to the guest pullman-style stateroom to port and a guest head with separate shower to the starboard. Forward of the port stateroom is the VIP quarters in the v-berth with a centerline oversized double berth. This spacious, bright, comfortable living area is comparable to most 60+ yachts. Settee and table to port. There are two overhead hatches with hinged screens, four opening ports, AC vents, two deck prisms and two fixed lights either side. The cabin sole is varnished teak and holly with traps to the bilge which open easily. The overhead is white formica secured with teak battens. The settees are comfort contoured and upholstered in a plush velour. There are two substantial stainless steel posts either side of the companionway stairs, overhead grab rails and hand rails providing safe movement thru the cabins in a seaway. The in-line galley is located in the starboard companionway which leads to the aft cabins. 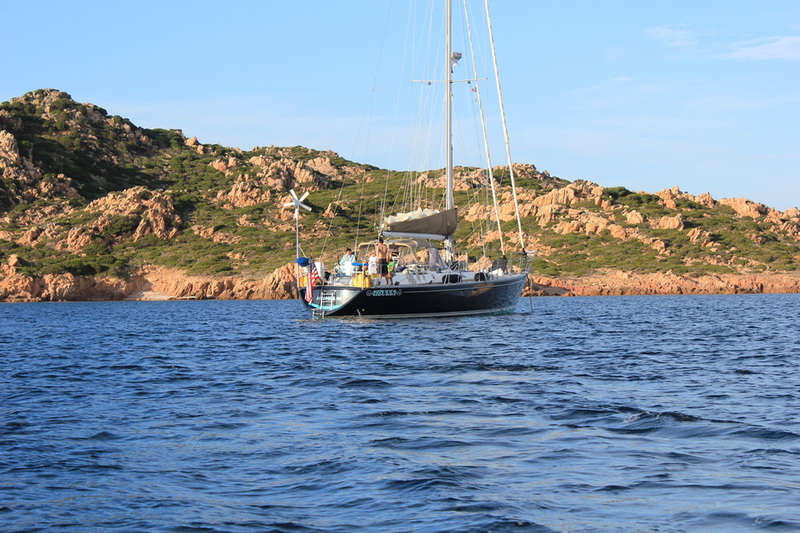 AZZURRA is very well equipped for blue water cruising. With navigation electronics both above and below decks, she offers safe passage to all of your cruising destinations. The systems are all fully integrated. Azzura features a fantastic walk-in mechanical room that provides easy access to the engine, generator, mechanics water maker and the battery bank. The engine room is accessed through the aft head's shower. Inside, a large workbench covers the Onan 8.5kw generator. The tractor quality (super longevity) upgraded Perkins 6-cylinder 135hp engine has only about 4000 hours on it and can easily be accessed from the mechanical room or from the other side. Her Onan 8.5kW genset with only about 4000 hours makes power for water, charges the batteries, powers the AC/Heating systems and keeps you in plenty of power no matter your needs. Azzura has one of the most seamless electrical installations I've ever seen on a yacht. Open up the back of the main electrical panel at the navigation station to get the first hint of how well it's designed and constructed. Open any access panel anywhere on the yacht and you'll see neat labeled wire runs, accessible wire chases, and cable runs. The boat connects to shore via a single 50A cable. She's got a full suite of 12V and 120V systems so that you can operate any appliance, tool, computer, or whatever without even thinking about where the power comes from and how much you have. 1350 amp hours in the house bank completely takes the subject off your plate. This truly is a yacht you can single hand if needed/desired. Everything leads to the cockpit and is amazingly easy to manage. She's a powerful and great sailing boat. With full canvas in 15 knots of wind, Azzurra will easily sail at 8 knots upwind and 12 knots downwind. Selden mast with stack pack system, five battens and three reef points in the mainsail, with Harken headsail systems for genoa and staysail with electric winches in the cockpit. It doesn't get easier. Nearly push button sailing with the electric assistance. The galley, located to the starboard of the companionway hatch, is a spacious walk through galley that features granite countertops with tons of counterspace, making it a very functional cooking space. The galley is just one step down from the main salon area so its open connection makes for easy entertaining down below. Facing aft, the galley features a stainless steel Broadwater 4-burner stove and a large Sea Frost (new 2012) refrigeration system with seperate fridge (side loading) and freezer (top loading) to the left as well as pull-out drawers and cabinets above and below the counter. To the right, there is a large double-bowl stainless steel sink as well as more counter space and storage. A centerline, queen berth is easily accessed from either side. There is excellent storage that includes four large drawers under the bunk, two hanging lockers either side at the foot of the berth and multiple shelves. Two doors provide either private access to the head or direct entry from the passageway to the main salon and navigation center. Access to the guest stateroom is at the end of a passageway. There is a large queen berth in each cabin. Each cabin has a good sized hanging locker, overhead lockers and drawer storage under the berths. Each cabin also has an opening port, overhead hatch, AC vent, dorade vent and a fan providing excellent ventilation and air movement. There is a separate stall shower, dorian counter vanity with oval, stainless steel sink and mirrored medicine cabinet. Locker storage under and outboard of the vanity. One opening port. Flag blue hull (solid) fiberglass sandwich deck. Decks are teak with molded non-skid and low maintenance aluminum toe rail. Wide side decks, genoa and staysail tracks (tracks have teak protectors). Cockpit seats and cockpit sole, "sunbathing" aft deck and sugar scoop stern swim platform are teak planked. There are stainless dorade protectors, mast "monkey bars", double rail stainless steel bow and stern pulpits, stanchions and lifelines with gates port, starboard and aft and a stainless steel swim ladder Teak decks over fiberglass. Aluminum toe rails. Stainless steel bow pulpit and stern push pit with double lifelines on side decks. There are convenient boarding gates on both sides and aft to the sugar scoop swim platform. The Tayana 55 is designed by the Dutch Naval Architect and designer Pieter Beeldsnijder. The hull is one of the most durable, versatile, safest and best performing hulls in its class. The wide beam easily accommodates the three-cabin layout, and few if any yachts of its size can carry its standard three-cabin layout with a full standup engine room so effortlessly. 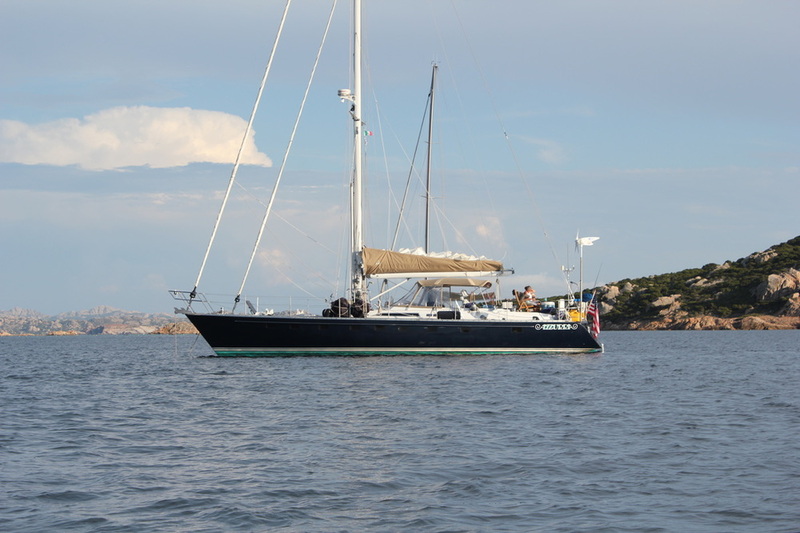 The Tayana 55 can be easily handled by a cruising couple by incorporating modern sailing technologies. Extra large tankage for both fuel and water is another gained feature of this spacious yacht. In this yacht, typical of any Tayana, every time you pull up a floorboard, there are clearly marked systems, thru-hulls, wire chases, plumbing runs, all logically installed and easy to service. Why Tayana and why THIS Tayana? Since 1973, the Ta Yang Yard on the southwestern shore of Taiwan has produced over 1400 blue water cruising yachts from 37’ to 72’ that continuously cross the oceans of the world. Production of the 55 began in 183 and continues today as the 58' model. She represents a perfect balance between form and function. 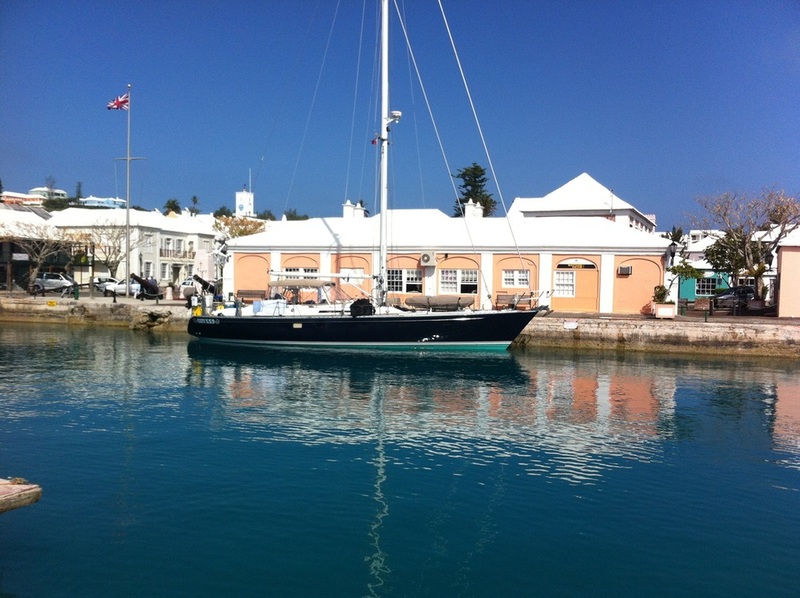 She has logged thousands of ocean miles and is truly the definition of a blue water cruiser. She’s big, heavy, fast, and powerful. At the same time, she’s completely rigged for short-handed sailing by a cruising couple. She’s so smartly designed and configured, she can be single handed with ease. This particular boat is in just magnificent shape and thoroughly outfitted for blue water passage making. Her thoughtful owners have kept Azzura in top shape, updated and ready to go at all times. She’s ready to take her next owners on more incredible journeys around the oceans of the world. Tayana Yachts have been considered the leader in building custom interiors for the last two decades, offering it's clients the luxury of a living arrangement they prefer rather than having to settle for the compromise of a production boat. Using the finest in solid exotic woods the best equipment such as Lewmar, Whitlock, Yanmar engines and Seldan Spars to name but a few, Ta Yang has achieved the reputation for building one of the finest semi-custom blue water cruising yachts in the world. Imagine a serious cruising yacht, at an achievable price, custom built by hand, around a proven and well-respected ocean-going hull, with a fit-out and rig perfectly suited to your requirements. Now step below deck; everything from the exotic solid wood finish to the air conditioning is just as you would have it! The comfort, the space, the stability, the quality of craftsmanship & the attention to detail make Tayana yachts an ocean ahead of those on the production line, whilst bridging the gap for what most of us would call an impossible dream. Tayana Yachts brings your ultimate aspiration into reality with their range of customized, ocean cruising yachts from 37' to 72'.